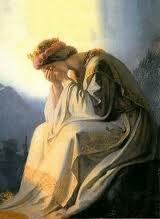 Although it often regarded by some detractors as somewhat of an anticlimax in comparison to the level of hype generated by the Fatima phenomenon, the published text of the Third Secret is actually one of the most profound, if not the most profound, private revelations in the entire history of the Catholic Church. With the level of focus concentrated upon the speculative content of the so-called "hidden text" of Fatima, the great depth of symbolism behind the published text of the Third Secret is quite unfairly overlooked. Yet once we begin to explore this material by applying a spiritual exegesis, the true prophetic depth of the Third Secret begins to reveal itself to us. In the book, I argue that Third Secret warns us that humanity is beginning to pose a very real threat to the sanctity of the "Tree of Life", through the manifold technological innovations that infringe upon the very source of human dignity. Just as Eve was tempted by the Serpent to eat of the Tree of Knowledge of Good and Evil, now as we are approaching the edge of world history, her offspring is clasping for the most precious of fruit of all - that of the very fabric of life itself. Humanity is beginning to make an assault on the Tree of Life by abominations such as the possibility of human cloning, or by tampering with the genetic code through stem cell research. While the possibility of achieving a culture of transhumanism is still at some point in the future, the assault on the Tree of Life is already well under way in the present, with what Bl. John Paul II described as the rise of the "culture of death". The rampant spread of abortion and euthanasia, and the continued foray into exploring the very essence of humanity by grotesquely manipulating the genetic code - even to the point of splicing it with animal DNA. These actions usurp the role of the Creator, replacing him with a distorted abomination which feigns life itself, dictating who is worthy to live and who should be put to death. "The sun's disc did not remain immobile. This was not the sparkling of a heavenly body, for it spun round on itself in a mad whirl, when suddenly a clamor was heard from all the people. The sun, whirling, seemed to loosen itself from the firmament and advance threateningly upon the earth as if to crush us with its huge fiery weight. The sensation during those moments was terrible." "As if like a bolt from the blue, the clouds were wrenched apart, and the sun at its zenith appeared in all its splendor. It began to revolve vertiginously on its axis, like the most magnificent firewheel that could be imagined, taking on all the colors of the rainbow and sending forth multicolored flashes of light, producing the most astounding effect. This sublime and incomparable spectacle, which was repeated three distinct times, lasted for about ten minutes. The immense multitude, overcome by the evidence of such a tremendous prodigy, threw themselves on their knees." So the Miracle of the Sun at Fatima on Oct 13th, 1917 appears to have symbolised the vision of the angel with the flaming sword described in the Third Secret - a threat which was first announced at the beginning of a century of genocide, and at the very moment of the rise of the militantly atheistic Soviet Union. 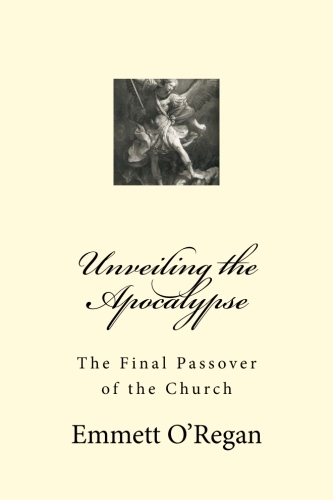 And in the interpretation I forward in Unveiling the Apocalypse, this was the same time period which saw the opening of the first of the seven seals of the Book of Revelation (see the post The Four Beasts and the Four Horsemen). ...Then God's temple in heaven was opened, and the ark of his covenant was seen within his temple. There were flashes of lightning, rumblings, peals of thunder, an earthquake, and heavy hail. "And if by this discipline you are not turned to me but walk contrary to me, then I also will walk contrary to you, and I myself will strike you sevenfold for your sins. And I will bring a sword upon you, that shall execute vengeance for the covenant." “For behold, the LORD will come in fire, and his chariots like the whirlwind, to render his anger in fury, and his rebuke with flames of fire. For by fire will the LORD enter into judgment, and by his sword, with all flesh; and those slain by the LORD shall be many." The sword itself is ultimately a symbol of war, and it is in this context that we find another biblical passage that the Third Secret alludes to, in the Book of Ezekiel. In the below passage taken from Ezekiel, there are references to God announcing the punishment of Jerusalem with His sword, which like the Third Secret is described as "flashing" ("flashing, it gave out flames that looked as though they would set the world on fire"). It is important to note that the Book of Ezekiel is one of the primary sources from which the Apocalypse derives its imagery concerning the Battle of Armageddon - an epic struggle which is also centred on the location of Jerusalem. The word of the LORD came to me: “Son of man, set your face toward Jerusalem and preach against the sanctuaries. Prophesy against the land of Israel and say to the land of Israel, Thus says the LORD: Behold, I am against you and will draw my sword from its sheath and will cut off from you both righteous and wicked. Because I will cut off from you both righteous and wicked, therefore my sword shall be drawn from its sheath against all flesh from south to north. And all flesh shall know that I am the LORD. I have drawn my sword from its sheath; it shall not be sheathed again. “As for you, son of man, groan; with breaking heart and bitter grief, groan before their eyes. And when they say to you, ‘Why do you groan?’ you shall say, ‘Because of the news that it is coming. Every heart will melt, and all hands will be feeble; every spirit will faint, and all knees will be weak as water. Behold, it is coming, and it will be fulfilled,’” declares the Lord GOD. (Or shall we rejoice? You have despised the rod, my son, with everything of wood.) So the sword is given to be polished, that it may be grasped in the hand. It is sharpened and polished to be given into the hand of the slayer. Cry out and wail, son of man, for it is against my people. It is against all the princes of Israel. They are delivered over to the sword with my people. Strike therefore upon your thigh. For it will not be a testing—what could it do if you despise the rod?” declares the Lord GOD. Exalt that which is low, and bring low that which is exalted. A ruin, ruin, ruin I will make it. This also shall not be, until he comes, the one to whom judgment belongs, and I will give it to him. ...Now the angel of the LORD had commanded Gad to say to David that David should go up and raise an altar to the LORD on the threshing floor of Ornan the Jebusite. So David went up at Gad's word, which he had spoken in the name of the LORD. Now Ornan was threshing wheat. He turned and saw the angel, and his four sons who were with him hid themselves. As David came to Ornan, Ornan looked and saw David and went out from the threshing floor and paid homage to David with his face to the ground. And David said to Ornan, “Give me the site of the threshing floor that I may build on it an altar to the LORD—give it to me at its full price—that the plague may be averted from the people.” Then Ornan said to David, “Take it, and let my lord the king do what seems good to him. See, I give the oxen for burnt offerings and the threshing sledges for the wood and the wheat for a grain offering; I give it all.” But King David said to Ornan, “No, but I will buy them for the full price. I will not take for the LORD what is yours, nor offer burnt offerings that cost me nothing.” So David paid Ornan 600 shekels of gold by weight for the site. And David built there an altar to the LORD and presented burnt offerings and peace offerings and called on the LORD, and the LORD answered him with fire from heaven upon the altar of burnt offering. Then the LORD commanded the angel, and he put his sword back into its sheath. At that time, when David saw that the LORD had answered him at the threshing floor of Ornan the Jebusite, he sacrificed there. For the tabernacle of the LORD, which Moses had made in the wilderness, and the altar of burnt offering were at that time in the high place at Gibeon, but David could not go before it to inquire of God, for he was afraid of the sword of the angel of the LORD. “See now that I, even I, am he, and there is no god beside me; I kill and I make alive; I wound and I heal; and there is none that can deliver out of my hand. For I lift up my hand to heaven and swear, As I live forever, if I sharpen my flashing sword and my hand takes hold on judgment, I will take vengeance on my adversaries and will repay those who hate me". Then I saw another mighty angel coming down from heaven, wrapped in a cloud, with a rainbow over his head, and his face was like the sun, and his legs like pillars of fire. He had a little scroll open in his hand. And he set his right foot on the sea, and his left foot on the land, and called out with a loud voice, like a lion roaring. When he called out, the seven thunders sounded. And when the seven thunders had sounded, I was about to write, but I heard a voice from heaven saying, “Seal up what the seven thunders have said, and do not write it down.” And the angel whom I saw standing on the sea and on the land raised his right hand to heaven and swore by him who lives forever and ever, who created heaven and what is in it, the earth and what is in it, and the sea and what is in it, that there would be no more delay, but that in the days of the trumpet call to be sounded by the seventh angel, the mystery of God would be fulfilled, just as he announced to his servants the prophets. The description of the angel with the open scroll is highly symbolic in itself. We are told that his appearance is as if he is "wrapped in a cloud" with legs like "pillars of fire" - a scene which conjures images of the attacks on the Twin Towers during 9/11. The rainbow above the angel's head signifies the promise given to Noah in Gen 9:13-17 that God would not destroy the earth again by flood - instead 2Pet 3:10-12 tells us that the world will be consumed by fire at the end-time. A further connection to New York may be made here in the fact that the description of the angel with the open scroll is deliberately modelled on the imagery of the Colossus of Rhodes - one of the seven ancient wonders of the world. The angel is gigantic in stature - with legs spread apart, one standing on land, one in the sea, with a hand stretched up into the heavens - just like the Colossus. 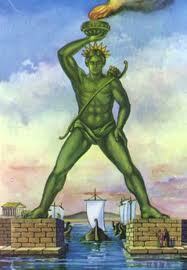 It is a well known fact that the design, posture and dimensions of the Statue of Liberty was modelled after the Colossus of Rhodes. And a poem titled "The New Colossus" by Emma Lazarus is found engraved on a bronze plaque mounted on the pedestal of the Statue of Liberty. Catholic evangelist Mark Mallet has recently posted an excellent blog article detailing the occult symbolism behind the Statue of Liberty, and how this is related to the identity of the Whore of Babylon - which you can find here. And as Rabbi Johnathan Cahn argues in his massively popular book Harbinger, the 9/11 attacks appear to foreshadow a chastisement still to befall the great city - which I suggest will come in the form of the Mega-tsunami threat posed by the collapse of the volcano Cumbre Vieja in the Canary Islands - the "great mountain, burning with fire" being thrown into the sea in Rev 8:8. When he opened the second seal, I heard the second living creature say, “Come!” And out came another horse, bright red. Its rider was permitted to take peace from the earth, so that people should slay one another, and he was given a great sword. Write this: Before I come as the just Judge, I am coming first as the King of Mercy. Before the day of justice arrives, there will be given to people a sign in the heavens of this sort: All light in the heavens will be extinguished, and there will be great darkness over the whole earth. Then the sign of the cross will be seen in the sky, and from the openings where the hands and the feet of the Savior were nailed will come forth great lights which will light up the earth for a period of time. This will take place shortly before the last day. Our Lady of Akita similarly spoke of the "Sign left by My Son", as one of the only sources of solace in the period of chastisement that is still to befall humanity. And although the signs spoken of at Garabandal and Medjugorje seem to refer to this same event, they put a different spin on it which links the appearance of the sign to their respective locales - making it a matter of cautious discernment. So it would perhaps be wise not to connect it too closely in our minds with these sites. Whether or not the promised "Great Sign" will appear at Garabandal or Medjugorje, or both, remains to be seen, and their authenticity are open to doubt. But given that the sign is also described in approved private revelations, it seems that this event will happen, and that it will be one of the greatest apparitions in history - eclipsing even that of Fatima in importance. 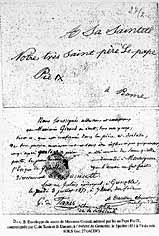 The exact nature of this apparition remains somewhat vague, but St. Faustina's diary is perhaps the best source of information we have on this subject - so we should examine this in closer detail. The darkness hanging over the earth described by St. Faustina appears to symbolise the spiritual darkness brought about by the Great Apostasy, which will be dispelled by the light of the Second Pentecost. 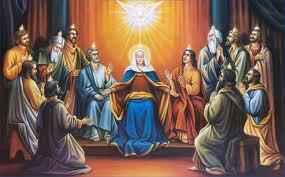 Here, it is foretold that the Second Pentecost will be brought about following a major apparition of a cross in the sky. We know from various other prophecies that the Second Pentecost will be spearheaded by the Two Witnesses of Revelation, and that it is also in some way connected with the martyrdom of a pope - so there seems to be a series of inter-connected events that will lead to the restoration of the Church. 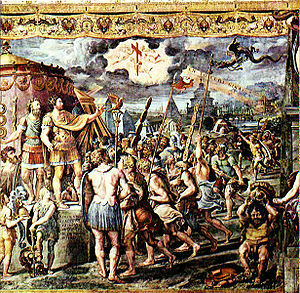 These prophecies of the dawn of a religious renewal after the appearance of a heavenly apparition, seem to be based largely upon Constantine's miraculous vision of the Chi-Rho symbol (also known as the Labarum) above the Sun before his decisive victory at the Battle of the Milvian Bridge in 312AD. This crucially important event would ultimately lead to the conversion of the Roman Empire to Christianity, and firmly establish Catholicism as the major religion of Europe over the course of the next two millennia. Constantine's vision is one of the earliest examples of a relation between heavenly apparitions and solar phenomena, which are so frequently prevalent in modern events - most notably the Miracle of the Sun at Fatima. Accordingly he called on him with earnest prayer and supplications that he would reveal to him who he was, and stretch forth his right hand to help him in his present difficulties. And while he was thus praying with fervent entreaty, a most marvelous sign appeared to him from heaven, the account of which it might have been hard to believe had it been related by any other person. 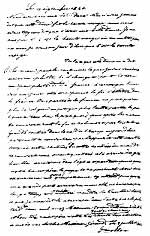 But since the victorious emperor himself long afterwards declared it to the writer of this history, when he was honored with his acquaintance and society, and confirmed his statement by an oath, who could hesitate to accredit the relation, especially since the testimony of after-time has established its truth? He said that about noon, when the day was already beginning to decline, he saw with his own eyes the trophy of a cross of light in the heavens, above the sun, and bearing the inscription, Conquer by this . At this sight he himself was struck with amazement, and his whole army also, which followed him on this expedition, and witnessed the miracle. He said, moreover, that he doubted within himself what the import of this apparition could be. And while he continued to ponder and reason on its meaning, night suddenly came on; then in his sleep the Christ of God appeared to him with the same sign which he had seen in the heavens, and commanded him to make a likeness of that sign which he had seen in the heavens, and to use it as a safeguard in all engagements with his enemies. At dawn of day he arose, and communicated the marvel to his friends: and then, calling together the workers in gold and precious stones, he sat in the midst of them, and described to them the figure of the sign he had seen, bidding them represent it in gold and precious stones. And this representation I myself have had an opportunity of seeing. Now it was made in the following manner. 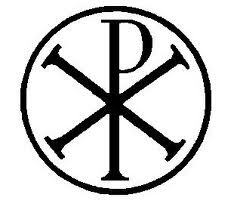 A long spear, overlaid with gold, formed the figure of the cross by means of a transverse bar laid over it. On the top of the whole was fixed a wreath of gold and precious stones; and within this, the symbol of the Saviour's name, two letters indicating the name of Christ by means of its initial characters, the letter P being intersected by X in its centre: and these letters the emperor was in the habit of wearing on his helmet at a later period. From the cross-bar of the spear was suspended a cloth, a royal piece, covered with a profuse embroidery of most brilliant precious stones; and which, being also richly interlaced with gold, presented an indescribable degree of beauty to the beholder. This banner was of a square form, and the upright staff, whose lower section was of great length, bore a golden half-length portrait of the pious emperor and his children on its upper part, beneath the trophy of the cross, and immediately above the embroidered banner. The emperor constantly made use of this sign of salvation as a safeguard against every adverse and hostile power, and commanded that others similar to it should be carried at the head of all his armies. 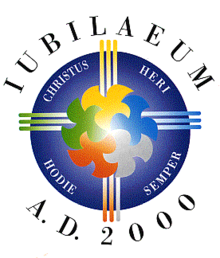 It should be further noted that the earliest authentic prophecy of the coming of the Great Monarch in the Latin version of the Tiburtine Sibyl, was actually based on the example of Constantine, rather than Charlemagne (see the full text of this prophecy in the earlier post here). So this could be yet another connection between the Two Witnesses of Revelation and the Angelic Pope and Great Monarch, who are similar prophesied conduits for the spread of Christianity at the end-time. ...Besides these [signs], a few days after that feast, on the one and twentieth day of the month Artemisius, [Jyar,] a certain prodigious and incredible phenomenon appeared: I suppose the account of it would seem to be a fable, were it not related by those that saw it, and were not the events that followed it of so considerable a nature as to deserve such signals; for, before sun-setting, chariots and troops of soldiers in their armor were seen running about among the clouds, and surrounding of cities. Moreover, at that feast which we call Pentecost, as the priests were going by night into the inner [court of the temple,] as their custom was, to perform their sacred ministrations, they said that, in the first place, they felt a quaking, and heard a great noise, and after that they heard a sound as of a great multitude, saying, "Let us remove hence." Some commentators have suggested that the "sword" or "cross" shaped star described here by Josephus may have been a near-earth supernova visible in the night skies over Jerusalem. And there have been frequent comparisons of this description with the Star of Bethlehem - which appears to be symbolically connected with this event. On an interesting side note, SN1054 - one of the few, and indeed best known, historically verifiable supernovae, took place in the year 1054AD, the exact year of the East-West schism that saw the division of the Roman Catholic and Eastern Orthodox Churches, ending a thousand years of Christian unity - which I suggest in the book may be the point of reference behind the millennial reign of Christ described in Rev 20. The comet described by Josephus here would thus most likely be the appearance of Halley's Comet in 66AD, which we have already identified as the "Wormwood Star" described in the Book of Revelation (see the post Wormwood, Chernobyl and the Hrushiv Apparitions). So Josephus undoubtedly viewed these astronomical events as omens which heralded the onslaught of the First Jewish Revolt, which lasted between 66-70AD. Prodigies had occurred, which this nation, prone to superstition, but hating all religious rites, did not deem it lawful to expiate by offering and sacrifice. There had been seen hosts joining battle in the skies, the fiery gleam of arms, the temple illuminated by a sudden radiance from the clouds. The doors of the inner shrine were suddenly thrown open, and a voice of more than mortal tone was heard to cry that the Gods were departing. At the same instant there was a mighty stir as of departure. Some few put a fearful meaning on these events, but in most there was a firm persuasion, that in the ancient records of their priests was contained a prediction of how at this very time the East was to grow powerful, and rulers, coming from Judaea, were to acquire universal empire. These mysterious prophecies had pointed to Vespasian and Titus, but the common people, with the usual blindness of ambition, had interpreted these mighty destinies of themselves, and could not be brought even by disasters to believe the truth. (Histories, Book 5, v. 13. See full text here). ...Then I heard what seemed to be the voice of a great multitude, like the roar of many waters and like the sound of mighty peals of thunder, crying out, “Hallelujah! For the Lord our God the Almighty reigns. Let us rejoice and exult and give him the glory, for the marriage of the Lamb has come, and his Bride has made herself ready; it was granted her to clothe herself with fine linen, bright and pure”— for the fine linen is the righteous deeds of the saints. “So when you see the abomination of desolation spoken of by the prophet Daniel, standing in the holy place (let the reader understand), then let those who are in Judea flee to the mountains." But the people of the church in Jerusalem had been commanded by a revelation, vouchsafed to approved men there before the war, to leave the city and to dwell in a certain town of Perea called Pella. And when those that believed in Christ had come there from Jerusalem, then, as if the royal city of the Jews and the whole land of Judea were entirely destitute of holy men, the judgment of God at length overtook those who had committed such outrages against Christ and his apostles, and totally destroyed that generation of impious men. Then I heard another voice from heaven saying, “Come out of her, my people, lest you take part in her sins, lest you share in her plagues; for her sins are heaped high as heaven, and God has remembered her iniquities." 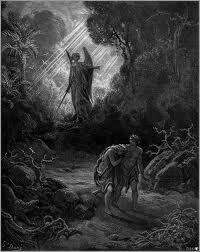 The two angels came to Sodom in the evening, and Lot was sitting in the gate of Sodom. When Lot saw them, he rose to meet them and bowed himself with his face to the earth and said, “My lords, please turn aside to your servant's house and spend the night and wash your feet..."
...Then the men said to Lot, “Have you anyone else here? Sons-in-law, sons, daughters, or anyone you have in the city, bring them out of the place. For we are about to destroy this place, because the outcry against its people has become great before the LORD, and the LORD has sent us to destroy it.” So Lot went out and said to his sons-in-law, who were to marry his daughters, “Up! Get out of this place, for the LORD is about to destroy the city.” But he seemed to his sons-in-law to be jesting. These are the two olive trees and the two lampstands that stand before the Lord of the earth. And if anyone would harm them, fire pours from their mouth and consumes their foes. If anyone would harm them, this is how he is doomed to be killed. They have the power to shut the sky, that no rain may fall during the days of their prophesying, and they have power over the waters to turn them into blood and to strike the earth with every kind of plague, as often as they desire. And when they have finished their testimony, the beast that rises from the bottomless pit will make war on them and conquer them and kill them, and their dead bodies will lie in the street of the great city that symbolically is called Sodom and Egypt, where their Lord was crucified. This event, which was prefigured in the planetary alignment of the year 2000 (just as the Star of Bethlehem prefigured the ministry of Christ thirty years later), will be the final layer to the "sign of the Son of Man" prophecy. Cell phones have been mooted to be the future of electronic commerce for a number of years now. Now it seems that another major development has been made in the replacement of credit cards with the use of mobile phone payment technology. A "GetCash" scheme was launched in the UK today which allows users to get cash from ATM machines without using credit or debit cards - by using their cell phones instead. Customers with a particular banking app on their phones can request to be issued with a six digit PIN on their handset, which is valid for three hours. They then enter this six digit code at the ATM to receive cash. Mobile phone payment technology took another step forward today with the launch of a scheme allowing people to take cash from an ATM without using their debit card. From today, people with the Royal Bank of Scotland (RBS) and NatWest mobile banking app can take money from an ATM by making a request on their mobile phone. They will receive a six digit pin number after making the request, which can be entered at a cash machine for the money to be released. The scheme aims to help people who may have lost or forgotten their card or those who might want to leave their wallet at home. The service, named GetCash, works at NatWest and RBS ATMs, with a limit of £100 per use. The pin codes issued are valid for three hours and people can use the scheme as many times a day as they need to, as long as they do not go over their withdrawal limit. It is available to around two and-a-half million customers who already have the banking app on their phone and those behind the initiative said it is a first for the UK. It seems that it won't be long before contactless NFC technology will be incorporated into ATM machines. This would allow users to receive cash simply by swiping their cell phones over readers, in the same way that you can already use contactless payments at many high street stores right now. Of course the present security issues will have to addressed first, before any significant transactions could be made. But the rapid progress of biometric mapping could provide an easily implemented and highly effective security measure, since cell phones already contain the necessary technology. Your cell phone could easily and instantly run an iris, fingerprint or facial recognition scan through the in-built camera, before allowing any transactions to proceed. This would virtually eliminate the possibility of fraud. Biometric technology is already used in many modern passports throughout the world, and it would simply be a matter of sharing data between different government departments before the widespread use of this technology could be implemented. Interestingly, it is in countries without a highly developed banking infastructure that mobile phone payments have taken off first. The BBC article and video from 2009 found here shows how cell phone payments were already widely available in Africa well before the introduction of contactless NFC payments in the West. So we still have some catching up to do.